MORE than 2,000 people from five villages of Odisha’s Angul district formed a human chain on January 5 to protest acquisition of Jamuda forest land by the Jindal Steel and Power Limited (JSPL). 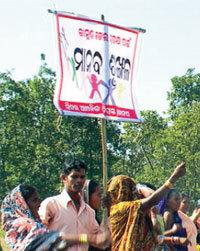 Under the banner of Anchalika Jindal Khyatigrastha Praja Samiti, residents of Sankerejenge, Badakerejenge, Sadanandpur, Duhidabeda and Jamuda villages shouted slogans against the steel major, accusing it of not compensating them for community property, including forest, grazing land and village ponds, acquired. The Rs 15,000-crore project—which will be the largest steel-producing plant in India—has been given environmental and forest clearance. But the company was served a showcause notice on November 22, 2010, as it started construction work even before the land was acquired. JSPL will submit its response to the environment and forests ministry on January 10, the company’s spokesperson said. The steel plant with a capacity of 12.5 million tonnes per annum and a captive power plant with a capacity of 2,600 megawatt require 2,018 hectare (ha). Of this, 168 ha is forest land. The protesters are demanding about Rs 6 million per ha for community land and permanent jobs to adults who lost their land. “The forest that JSPL wants to acquire was nurtured by people of the area for 40 years. It is called government land but is community land for the people. And they are not being compensated for this loss,” said Rabi Patnaik, convenor of Anchalika Jindal Khyatigrastha Praja Samiti.